My first metal detecting video. So today I headed down to my local small pasture permission to record my first metal detecting video. I had to use my smartphone to record it because the sportscam I bought turned out to be a turkey so its on its way back to the seller ad we speak. It was a dull dark overcast morning and bloody freezing but never the less it turned out to be one of the best mini sessions I have ever had with some quality finds made. I found some older pre decimal coins which I never tire of finding and also a gold ring which is my first one for probably around a year now I believe. I enjoyed making the video but I must admit I felt a bit nervous even though technically no one was watching me I still knew that potentially thousands of people could end up watching me, I'm quite shy haha. Anyway please feel free to check out my metal detecting video on YouTube by clicking this link to YouTube and don't forget to subscribe so you don't miss my next ones. Very good effort Andy on your first video. You came across nice and clear and what a treat to see your gold find. Will look forward to your next one. 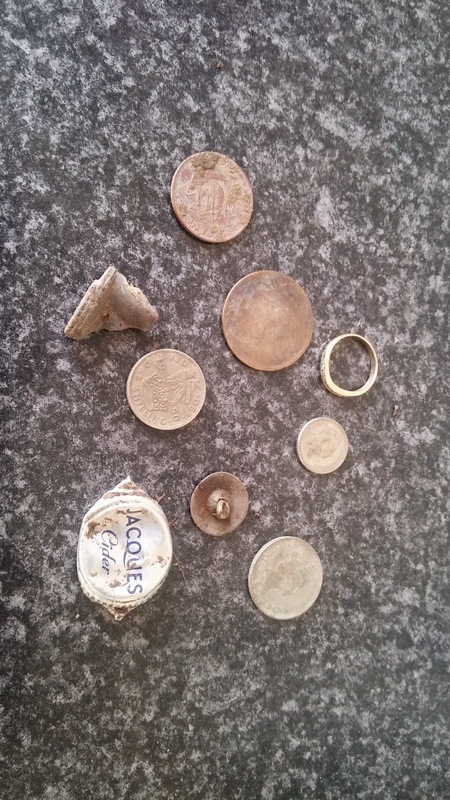 Thanks Janner, hopefully next time will be a better effort now I have list my metal detecting virginity haha. I really want to have a trip to the beach tomorrow but unfortunately I don't think my other commitments will allow it so maybe another quick look round the field I did today.